Going To Hat Yai From Phi Phi? Hat Yai is located in the south of Thailand, about 45 minutes from the border of Malaysia. Hat Yai is full of hotels, markets, food stalls, shopping malls, and nightlife, so it's a terrific place to stay the night before you travel onwards to get to Koh Lipe or other Southern destinations. If you don't want to stay a night in Hat Yai, arrive early to make sure you make it on the last boat or ferry to Koh Lipe from Pak Bara. The easiest way to get to/from Hat Yai from Phi Phi is to first go to Krabi and then take a bus or taxi to Hat Yai. The boat from Phi Phi to Krabi takes about 1.5 hours and then depending on taxi or bus, it's another 4 hours to Hat Yai from Krabi. Visit our Van & Taxi pages for prices and times. Buses depart almost hourly to Hat Yai from Phuket, Krabi, and Bangkok. A taxi to/from the airport costs about 350 baht to get to the Hat Yai City Center. Hat Yai has great markets, shopping, a hospital, and some fantastic restaurants, like The Swan. There is plenty of accommodation. 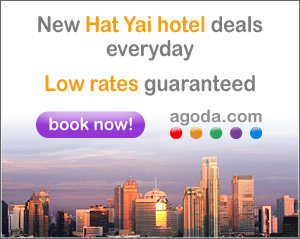 A complete list of HatYai Hotels with special promotions and discounted rates with Agoda.com. A complete list of Hat Yai hotels with special promotions and discounts! If you are going to Koh Lipe from Hat Yai, the mini-bus station has moved outside of the city centre, transfer to Pak Bara is about 180 baht, however, the driver waits until the bus is full which could delay your departure. There aren't any mini-buses that go directly from the Hat Yai airport to Pak Bara which is where you need to go to catch a boat or ferry to Koh Lipe. The cheapest option you have is to take a mini-bus to the Hat Yai train station (cost: 80 Thai baht/person), then talk to a travel agency nearby to arrange a mini-bus straight to Pak Bara (cost: 150 Thai baht/person). or.......We can arrange a private taxi or mini-van directly from the Hat Yai airport, or Hat Yai City to Pak Bara pier. Ferries and speedboats Schedule Ferries and speedboats leave daily (certain periods) from Pak Bara to Koh Lipe and they depart from 09:00 a.m. - 15:30. A one-way trip will cost you 650 Thai baht and a roundtrip will cost you 1,200. You can buy your tickets in Pak Bara or if you wish we can handle all of that for you, just Contact An Agent. Be very careful if you decide to purchase your speedboat or ferry ticket to Koh Lipe from the Hat Yai mini-bus station, as they are notorious for selling you false tickets and providing incorrect information. Wait to buy your boat or ferry tickets until you get to Pak Bara or just to be safe, we can arrange all of this for you so you don't have to lift a finger. If you arrive in Hat Yai before 10:00 a.m. (11:30 a.m. if you've already arranged the necessary transportation) then you will have enough time to make it to Pak Bara before the last boat and ferries leave. If you arrive after that time it would be wise to spend the night in Hat Yai or travel to Pak Bara and spend the night there. Again, check our hotels in Hat Yai page to find the best deals on accommodation in this neat little southern Thailand city. If you're coming from Hat Yai, it only takes 2 hours to get to Pak Bara, where ferries run year-round to take you to exquisite Koh Lipe island. If you're coming from Krabi or Phuket, it takes 4-6 hours to get to Pak Bara without having to stop in Hat Yai. Hat Yai City Center - The mini-bus station is no longer inside the Hat Yai city center and has moved just a few short minutes away (you can arrange pick-up from your place of accommodation or take a tuk-tuk/taxi to the mini-bus station). From there, transfer to Pak Bara from the Hat Yai mini-bus station will cost you about 150 Thai baht. As it is Thailand, the driver will not leave until the mini-bus is completely full so don't expect to depart on time. Hat Yai is a city and surrounded by concrete, so it seems sometimes like an oven, but it's not that bad. The hottest day of the year is April 13. Hat Yai has an average high of 34°C and low at 24°C. The coldest day of the year is January 28, with an average low of 22°C and high of 31°C.